This self-help guide offers management and communication advice centered around Bible verses and inspirational quotes. In order to be more productive and happy at work, at home and in the community, people need to sharpen their emotional quotient or emotional intelligence (also known as EQ), states Ogunyemi in his debut work. 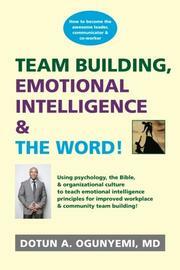 He writes, “EQ has been linked to performance; studies have demonstrated associations among team building, leadership success, employee morale, job satisfaction, conflict resolution, and client satisfaction.” In 12 chapters that cover judgment, obstacles, foolishness, temptation, forgiveness, leadership and more, Ogunyemi explores how to be a more emotionally attuned, compassionate boss and person. In each chapter, he employs several Bible verses to support his arguments, as well as inspirational quotes from famous writers, scientists and leaders. Ogunyemi writes with the warmth of an older relative dispensing sage advice. The number of Bible quotations (a handful are found in each chapter) might be off-putting for non-Christian readers, but it’s hard to argue with most of the basic principles the author endorses—forgiveness, compassion and self-awareness. At times though, his writing style becomes more lecturing than inspiring, dictating how the reader should and should not behave. Many of the book’s anecdotes feature oversimplified examples of conflicts and consequences, reading more like parables than realistic case studies: People’s shortcomings render them miserable and destitute, while others take the righteous path and become ridiculously successful. The parable-as-case-study approach may work for some readers, but a few of the tales uncomfortably cross the line into victim blaming. For example, an actress is preyed on by a producer not because of his maliciousness, but because of her desire for the role; while a manager’s wife gets hit on by a CEO ostensibly because the manager—not the CEO—made bad decisions that night. Some readers looking for Christian-themed inspiration will enjoy the book’s nuggets of wisdom, but others may find the text too preachy to parse and the examples too simplistic to be useful. Readers may have difficulty drawing real-world advice from the book’s sermonizing and positive quotes. Tomorrow Can Wait...Yesterday Is Past...Live Today!